OEM/OHP 5000 Digital Player -- Use this unit with your PBX/KSU system that includes a Message On-Hold (MOH) input jack. Just drop in a single or multiple track CD (Redbook Audio), close the lid -- the OHP 5000 series player spins up the disc and downloads it into the internal non-volatile digital flash memory (immune to power outages) automatically! Playback begins immediately as the CD transport then shuts off and waits for your next message update. Want to record more than one track? You can do that, too! With the included Multi-Track Programming feature, just drop in a multi-track CD, audibly preview and select the tracks you like and in the order you like, up to the total capacity of your OHP5000..
OHP 5000 series players come with 8-minute recording/playback capacity. Want more time? Simply lift a door to add memory modules and may be upgrade to 16, 24 or 32 minutes (subject to memory availability). IS THE OHP5000 RIGHT FOR YOU? industry! Updates are as simple as that! The OHP 5000 loads any standard Compact Disc (CD) of one or more tracks. If your CD has multiple tracks, simply select the desired tracks up to your memory limit (8 minutes standard, upgrade to 16, 24 or 32 minutes) and press the RECORD button. Those tracks will now "load" to its internal Flash Style computer memory chip(s). Once loaded, audio remains onboard even during power bumps and outages.... no batteries to monitor or replace - your audio remains intact. To take advantage of the "Auto Load" feature simply insert a single track CD (as would be provided by Powers Productions), close the lid and walk away. 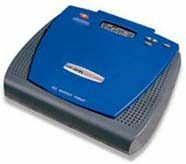 Your OHP 5000 now spins the CD, loads your message into its internal memory chip and shuts off the CD transport until your next message update. Feel free to remove the recorded CD at any time. Need to increase your record/playback time to more than 8 minutes? Our Memory Chips add additional capacity to 16, 24 or 32 minutes in 8 minute intervals. The OHP 5000 utilizes ISD Chipcorder technology which was chosen for its superior sound quality over typical flash-memory-based systems. Sound quality is comparable to systems with 128Kbps or better sampling rates. 8KHz Sample Rate .Retains music/message content even during power outages. Quickly and easily record high-quality audio with the built-in CD transport. Drop in a CD with a single track, close the lid, and the unit automatically records the content. Drop in a Multi-Track CD and choose which tracks and in what order to record. Maximum number of messages: 31. The OHP 5000 ships with 8 minutes of digital flash memory. This may be upgraded to 16, 24 or 32 minutes (subject to memory availability). Displays program length, time remaining in unit's memory, and unit's current mode of function. Audio input allows you to record from any external audio source. Your source might be a computer sound card or any device that outputs a standard audio signal. Just plug in to your telephone's Music/Message On Hold audio input with supplied audio cord. Allows user to monitor sound with the flip of a switch during Record or normal Playback. Unit can sit on any horizontal surface or be mounted, played and recorded in a vertical position. For Point of Sale or special purposes, unit can be triggered to start program content from the beginning with an external trigger switch.